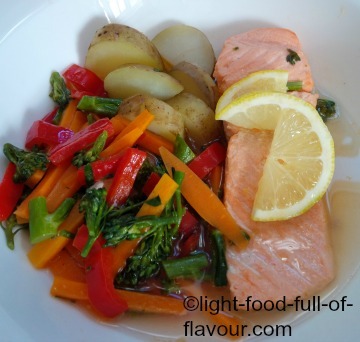 Summer time, and the food is easy – and light like this poached salmon and vegetable dish served with new potatoes. 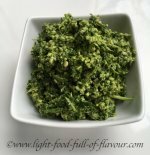 Once you’ve prepared the vegetables, it is also quick to make. And it’s healthy and kind to your waistline. What’s not to like? I love it! The broth that I poach the salmon in tastes amazing thanks to a simple trick. I add a splash of cider vinegar together with some lemon thyme, lemon zest and some salt and pepper to fish stock and let it simmer for a bit before adding the fish. You can use a small glass of a tasty dry white wine instead of the vinegar but I think the vinegar adds more of a punch taste-wise. Save the wine for drinking! I confess that as much as like to cook from scratch, the one thing I seldom make myself is stock. I also seldom mention a certain brand of food but – and I am not paid by this company, or any other – I do love Knorr fish stock. I cook the potatoes and vegetables separately and add them to the broth once the fish is cooked. Doing it this way makes it much easier to control the cooking time of the different elements to this dish – I like my vegetables to be crunchy. Okay, on to the recipe for poached salmon and vegetables. 1. Start by making the broth. Place the fish stock in a large enough pot to hold the salmon. Add the vinegar, lemon zest, lemon thyme, salt and pepper to the stock and bring to a slow simmer. 2. Boil the potatoes in a separate pot. Unless the potatoes are very small, you could slice them to make them cook quicker. Once they are ready, sieve off the water and cover with kitchen roll first and then the lid - to keep them warm and to remove moisture from the potatoes. 3. Add water to another pot and get it boiling. Start by adding the carrot batons. Cover the pot with a lid and simmer for 2 minutes. Add the pepper and broccolini to the pot, cover with the lid and simmer for a further 3 minutes. Sieve off the water, cover the pot with the lid and leave to the side while you cook the salmon. 4. Add the salmon to the pot with the simmering broth and cover the pot with a lid. Poach the salmon fillets for about 10 minutes. Check with a knife to see that salmon is cooked. Serve the poached salmon and vegetables in large soup bowls. Add a fillet of salmon to each bowl and divide the vegetable and potatoes between the bowls before pouring over the broth (use all of the broth as this is so tasty). If using, let everyone help themselves to the mayonnaise.